Today's Home Office stories include the EU Settlement Scheme fee waiver and Border Force cutters. There is widespread coverage of yesterday’s announcement by the Prime Minister that the Home Office would waive the £65 fee for EU citizens applying to stay in the UK. The decision to axe the fee was covered widely on social media, with the BBC’s tweet receiving 26,000 interactions. The Times says that EU leaders have welcomed the move. The European Parliament’s Brexit coordinator, Guy Verhofstadt, is quoted as saying that the decision was “a victory for common sense”, adding that during negotiations the European Parliament had pushed to ensure that “EU citizens are not financially punished for the Brexit referendum outcome”. The Independent reports that while MPs from all parties have welcomed the move, some have said the fee should not have been introduced in the first place. More information on the EU Settlement Scheme fee waiver can be found in our fact sheet. The Times, Telegraph, Independent, FT, Mail, Express, Sun, Star and Metro report on the two Border Force cutters making their way to the English Channel from the Mediterranean. According to the reports, the cutters are still in port in Malta and Gibraltar three weeks after the Home Secretary pledged to recall them. Reports reflect that the two ships are undergoing "routine maintenance" and are not expected to be operational until early February. The Home Secretary’s comments in the Commons are widely quoted, noting that while the cutters make their way back, further resource has been provided in the form of HMS Mersey. The Home Secretary also indicated that he was to meet his French interior minister counterpart this week to review the "action plan" agreed between the two countries before Christmas. It is reported that he will also demand France takes tougher action to ensure asylum seekers submit their claims in the first "safe" country of arrival. We have stepped-up our law enforcement response to the situation in the English Channel through the NCA and other agencies and two Border Force cutters are returning to the UK – with a navy vessel helping with our patrols in the interim. The UK and French authorities continue to work closely through the new 24/7 Anglo-French co-ordination centre in Calais and we are developing our joint action plan which will build on this work. Claiming in the first safe country is the swiftest way to get protection for those fleeing torture and persecution. 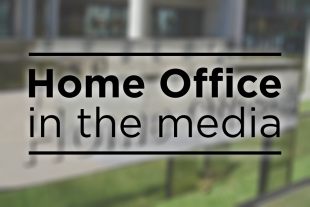 This week the Home Secretary made clear that if we receive an asylum claim from an individual that has clearly travelled through an EU state – where he or she could have sought asylum – we will seek to treat that claim as inadmissible.